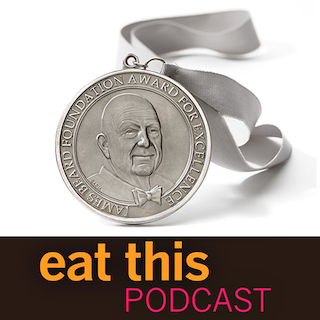 This episode is a repeat of one first published in October 2014, and the reason is that it has been nominated for a James Beard Foundation Award. I’m utterly thrilled by the news, and gratified that more people have downloaded episodes and subscribed to the show. Strangely (at least to me) the original did not see huge renewed interest, which is why I thought it worthwhile repeating. If you’ve heard it, and don’t feel like listening again, you could go and listen to one of the other two nominees, in the notes below. Being nominated is an immense honour. I won’t know whether I have actually won until the award ceremony on 24 April. Citrus, thanks to what writer Helena Attlee calls their great “suggestibility,” confound the botanist and the shopper alike. What is the difference between a clementine and a mandarin? That was one of the few questions I didn’t ask Helena Attlee when we met recently to talk about citrus in Italy, the subject of her new book The Land Where Lemons Grow. And not just lemons. Attlee writes beautifully about all the citrus and all of Italy, from Lake Garda in the north to Palermo in the south. She covers not merely the tendency of citrus to interbreed and mutate, but also history and economics, culture, cooking and organised crime. Through it all runs a continuous thread that links the very difficulties of growing citrus productively to the desirability of the finished products, on which fortunes and entire communities were built. The Land Where Lemons Grow proves, as if it needed proving, that food provides a perfect lens through which to view the entire world, as a result of which I had to cut some choice sections from our conversation. That, however, has prompted me to try something new here, which will become apparent in a day or two as I also attempt to tidy up a bit here. The other award nominees are Gravy and The Feed. Intro music by Podington Bear. Really fascinating. I had no idea about the mafia business.